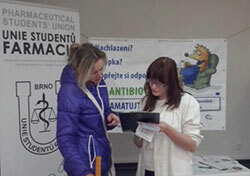 Member of the Union of Pharmacy Students (right) raising awareness in a pharmacy in Czech Republic on EAAD, 18 November 2014. In line with new evidence that pharmacists have a key role to play in promoting the prudent use of antibiotics, EAAD 2014 focused on highlighting their role and best practices. WHO country offices supported Member States in organizing conferences, workshops and press conferences. Experts from WHO/Europe, ECDC and the European Commission directorates-general for research and innovation and for health and consumers participated in a live Twitter chat held on 18 November 2014. Scores of EAAD events took place throughout the Region, including in an increasing number of countries outside the European-Union (EU). Here are some highlights of these activities. Educational and promotional materials – including brochures, infographics, videos, posters and banners – were displayed in pharmacies, doctors’ waiting rooms and/or hospitals in several Member States. Some WHO and ECDC materials were translated into local languages and disseminated to the public. The WHO Regional Director for Europe, Zsuzsanna Jakab, health ministers and high-level officials of health authorities of the 10 countries belonging to the South-eastern Europe Health Network celebrated EAAD at an extraordinary ministerial meeting of SEEHN in the former Yugoslav Republic of Macedonia. In addressing the participants, the Regional Director applauded EAAD’s success as a pan-European initiative. In Albania, researchers, clinicians, microbiologists and public health specialists came together to share their findings and recommendations on a number of issues, including guidelines from the European Committee on Antimicrobial Susceptibility Testing (EUCAST), levels of antibiotic consumption in the country and public awareness of antibiotic resistance. The Head of the WHO Country Office stressed the importance of multisectoral collaboration and pledged WHO’s support in assessing the situation and developing and implementing a national action plan to address the antibiotic resistance in the country. In Armenia a draft national strategy on prevention of antimicrobial resistance (AMR) was presented, and drug-regulatory tools to combat AMR were discussed. Activities in the Czech Republic included an exhibition called “Antibiotics – an endangered treasure of humankind”, held in the lobby of the Ministry of Health. At a press conference in Georgia, representatives of the National Centre for Disease Control, the Ministry of Labour, Health and Social Affairs and the Ministry of Agriculture/National Food Agency discussed the establishment of a national AMR working group, the national strategic action plan on AMR developed in 2014 and the progress made since the sale of antibiotics without prescription in pharmacies was restricted in September 2014. In Lithuania, a conference on hospital infections and management of AMR in the health care sector targeted leaders of health care institutions. Lectures and discussions were organized in Serbia for general practitioners and paediatricians from all primary care institutions in the country. A press conference was organized in Slovakia by the WHO country office, the representative of the EU in Slovakia, the Association of General Practitioners for Adults and the Slovak Patients Association. An expert meeting in Slovenia targeted health centre and hospital managers, professional medical associations and representatives of the veterinary profession. It focused on preventing the spread of infection in hospitals and self-medication at home with antibiotics left over from previous treatments. A symposium held in Istanbul, Turkey raised awareness among 600 clinicians, family physicians, pharmacists, academics, and health-policy makers on the importance of the rational use of antibiotics. Coverage of EAAD in the traditional and social media included reports from press events in Armenia, the Czech Republic, Georgia and Montenegro; an article in the main newspaper in Belarus; and the participation of the Minister of Health of Lithuania in a national television programme. In addition, a press conference was organized, in collaboration with the WHO Office, Pristina, in Kosovo (in accordance with Security Council resolution 1244 (1999)); it focused on the over-the-counter sale of antibiotics in pharmacies.